You won't want to spend hours in the kitchen over the Easter break. Save time by using a good stock to add fantastic flavour in some quick to prepare dishes. Take stock with these five Easter recipes, which all show how Essential Cuisine's professional quality stock can bring a simple dish to life. Andy Waters' simple chicken and vegetable bake recipe makes a perfect Easter dinner. The mix of vegetables, sweet maple syrup and tender chicken breasts will go down a treat with the whole family. Poaching chicken in stock is a lot healthier than frying, which makes this recipe perfect if you feel there's been a little over-indulgence in chocolate! Frances Atkins’ dish is healthy, elegant and tasty. Her impressive seafood stew is presented to look like a rock pool with an Omega-3 packed helping of mussels, crevettes and potted shrimp. Use chicken or vegetable stock to balance the seafood and produce a fresh dish for Easter. This lamb shank recipe from Martin Wishart is the kind of recipe that people return to again and again. It's easy to prepare and many of the ingredients are household staples. As a hard working muscle, the shanks are not suitable for roasting and require slow cooking and a rich stock. Your patience will be rewarded with tender, flavour packed meal that requires little attention while cooking. 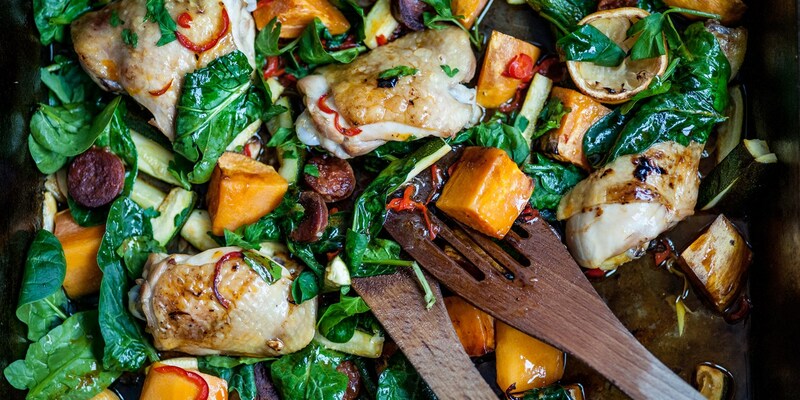 The beauty of Nathan Outlaw's recipe is that all the ingredients are cooked together in one pan, saving time on washing up over the Easter break. Chorizo and chicken makes for an interesting pairing when cooked gently in stock, while the lemon providessharpness and chilli packs a punch. Use sweet potatoes, courgettes and spinach as wellto get some healthy vegetables into the mix too. The three C's of carrot, coriander and cheddar combine beautifully to make this side dish or snack from Marcus Wareing for the long Bank Holiday. It's another one pot dish where stock provides the backbone to the recipe. Serve as a creative side with your main Easter roast or with some fresh crusty bread as a simple supper. Visit Essential Cuisine for a range of professional quality rich, tasty & flavour packed stock products that are perfect for easy to make dishes over the Easter holiday.